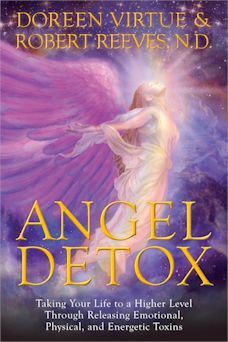 Book: “Angel Detox” by Doreen Virtue and Robert Reeves N.D.
To begin with the front cover illustration of the angel is beautiful. However, I had a different perspective when I started to read this book. I was not exactly sure what I would find in this book called “Angel Detox.” Some of the advice is good but I have read similar information in other books like the books by Kevin Trudeau. There is a detox for 7 days for items such as detoxing from sugar, soda drinks, caffeine, alcohol, drugs, smoking and so forth. There is quite an extensive discussion about chemicals in many of the products we use regarding Genetically Modified Organisms (GMO). You are given advice as to what to buy and what not to buy because of the changes made to the products such antibiotics, pesticides and other contaminants which are for the benefit of the big company but not the health of the population. I enjoyed reading about Emotional Detox. I liked what was said in terms in dealing with negativity. I also found it interesting that the authors depend upon a lot from prayer and particularly in God, the Archangels and the Angels. To me, I question whether one is hearing from Archangels or just from your Higher Self with advice on how to live a better life. I suppose it could be a matter of perspective and philosophy on this issue. The book also discusses flower therapy, essential oils, and crystals in many of the chapters. I wonder how this information came out that a certain Archangel is attached with a certain type of flower. Who knows this information? How is it validated? There is quite a bit of information on flower therapy, essential oils and crystals as it relates to detoxing. This books tries to address many subject matters. Some of the main information is repeated a number of times but I guess the authors are trying to make sure we get the point. I would recommend this book for people who do want to detox their lives. 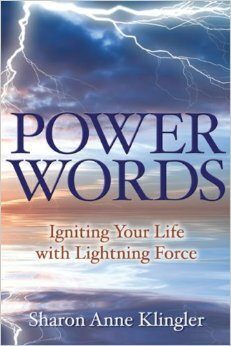 I just finished reading this book, “Power Words, Igniting your Life with Lightning Force” by Sharon Anne Klingler. Overall, it is very well written and an easy read. I found that this is a basic book regarding the power of words whether they are affirmations, prayers or trigger words. If you have ever read any material by Shakti Gawain or Louise Hay, then you are knowledgeable about affirmations. Sharon Anne Klingler shows how words and even thoughts are important in that they carry either positive or negative energies. Sharon discusses a number of studies to show how positive prayer affected some patients as compared to the control group. She compares a number of words by asking you to go into yourself with eyes closed to feel the energy of the word. For example, if you close your eyes and think of a word such as “hate,” you may feel a heaviness in your body, perhaps in your heart area. Then, you are to blow out that feeling and replace it with the word “love.” Again, you may feel something in your heart area but this time it is lighter and not as negative as the “hate” word. I found that doing these exercises reinforced how negative words ended up showing up in my lower chakras and sometimes in my heart chakra. I found that positive words ended up showing up in my heart chakra and above. There is a direct relationship of feeling between the two energies of the two words. Doing this feeling work of energetic words in my body was a visceral experience for me. I really felt it in my core. I have not read any other material or books by Sharon Anne Klingler so I was pleased to see that this book was well-written based on what she said and how she did give case examples of people who have changed their lives while focussing on power words. I found some of the material reminiscent of what Rhonda Byrne talked about in “The Secret.” The difference is that it is not only the word that is followed but also the need to make some action towards the goal or objective. You can not idly stand by and hope your situation will change on its own without some work on your part. I particularly liked the reference to Dr. Masaru Emoto who photographed water crystals and how they were affected respectively by words. If the words were negative, the water crystals were not clear and in most cases deformed or malformed. However, if the words were positive, the water crystals were beautiful and symmetrical. I also appreciated knowing which areas the Archangels are responsible for when invoking higher beings to help with your problems. All in all, after having read and reflected upon this book, I would recommend this book for people who are interested in learning about energies and are new to the New Age philosophies or if you would like a recap or reminder of how important your words are to manifesting your desires.